As I mentioned yesterday with Brian Hunter, several members of the 1990 Richmond Braves would go on to play crucial roles in the 1991 Atlanta Braves and their run to the World Series. Jimmy Kremers can be counted among that list, though not in the usual way. Kremers was a high draft pick for the Braves in 1988, taken in the second round. 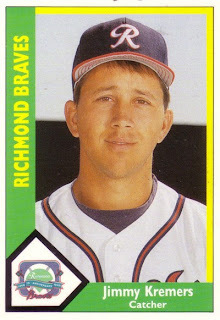 He played at single-A Sumter that year, taking AA Greenville in 1989 and making AAA Richmond in 1990. The progression would continue in 1990, with Kremers debuting with the big club June 5 that year. In 29 major league games that summer, Kremers came to the plate for 73 official at bats. He got only eight hits, for a half-Mendoza average of just .110. But he also had one home run. According to one account, Kremers smacked that home run after hall of famer Don Sutton complimented him on the TV telecast for his catching abilities, but said Kremers was overmatched at the plate. Kremers, according to the account, promptly hit it out. Despite his problems at the plate, Kremers still had some value. On April 1, 1991, the Braves dealt Kremers to Montreal for Otis Nixon. Nixon went on to steal 72 bases for the upstart Braves before a failed drug test put him on the shelf for the post season. Kremers spent 1991 at the Expos AAA club in Indianapolis. Kremers hung on at AAA for four more years with the Expos and Brewers organizations without a call-up. In 1995, Kremers dabbled with replacement ball, something he was having second thoughts about toward the end of spring training. "The answer is probably no," Kremers told the South Florida Sun-Sentinel on whether he would be a replacement. But he ultimately decided yes. "The bottom line is I've got to take care of my family," Kremers told the Palm Beach Post. "If this thing ends on opening day, I'll at least make $70,000 or $80,000." Kremers played 85 games for Florida's AA club in Portland that year, his final year in pro ball. Kremers is still playing baseball, actually, he's teaching it. He's owner and instructor with the Baseball Academy of Tulsa. Links to the Palm Beach Post story and the Sun Sentinel story.